The vacation of her nightmares might just hold the key to her heart. Monroe Dune never thought it would be a simple wound that would fell him. Resigned to his fate, he sets sail to return to his castle intent on being the last person to ever live on the Isle of Dune. His plans are upended when a mysterious stowaway who refuses to let him die ends up trapped on the isle with him. Despite his best efforts to keep the lass at bay, she slowly but surely finds a place within his heart. Does he love her enough to send her away? Or can they find a way to change history and find happiness together? BETHANY CLAIRE is a USA Today bestselling author of swoon-worthy, Scottish romance and time travel novels. Bethany loves to immerse her readers in worlds filled with lush landscapes, hunky Scots, lots of magic, and happy endings. She has two ornery fur-babies, plays the piano every day, and loves Disney and yoga pants more than any twenty-something really should. She is most creative after a good night's sleep and the perfect cup of tea. When not writing, Bethany travels as much as she possibly can, and she never leaves home without a good book to keep her company. If you want to read more about Bethany or if you're curious about when her next book will come out, please visit her website at: www.bethanyclaire.com, where you can sign up to receive email notifications about new releases. I was so thrilled to see a new Morna story as I have loved them all. This story had so much potential, great characters and an intriguing story. I really think this should have been a full novel. There was so much of the story that felt rushed and untold. This won’t keep me from buying the next book but this one was a disappointment. 3 stars not for what it contained, but for what it did NOT contain. I know this was a novella but I still couldn't help but feel frustrated. So much more could have been included. For instance, how did that rock work so that Eleanor could pin-point the time in which she wished to travel? Going with her to Conell Castle would have been so entertaining, even if for a brief visit. The reason for the haunting of Castle Dune wasn't as spooky as I had hoped. Anyway, I love this series and will contintue to read every release. Maybe a novella can have a sequel? Please??? 2.0 out of 5 starsStick with full-length novels. I have liked most of Bethany Claire’s books. I think she does better in a full, fleshed out novel. This one felt too rushed for me, ergo unbelievable. I do have one correction. Eleanor said she was not a medical doctor. Then a few chapters later said she was a psychiatrist. It is my understanding that the prerequisite for a psychiatrist is an MD. A psychologist does not need a medical degree and cannot prescribe medications. I still look forward to her next full-length novel. I can just imagine hearing Jerry, Morna's husband saying, "What are you involved in this time" or "I see you are at it again". 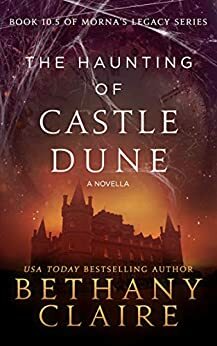 The saving of Castle Dune was a fun and delightful romantic adventurous task Monroe and Eleanor found themselves involved in. As all goes well in the end, it was entertaining following along. This was such a great story how Eleanor and Monroe fell in love typical Morna style. 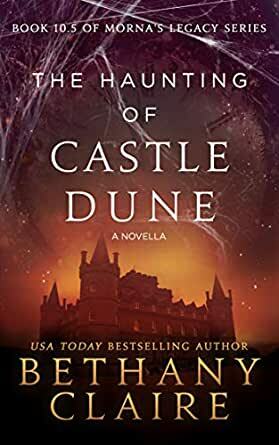 I hope in a future book we learn more about the family and ancestors of Castle Dune, thanks again Bethany for keeping us interested in these wonderful characters as they always feel like coming home.